Starnali farm is an organic farm that is situated between Mount Caruso and the Gulf of Gaeta , on the border of the national park of Roccamonfina . It extends for forty hectares for the cultivation of wine, oil, and chestnuts. 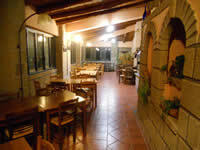 It 's also a beautiful country inn with rooms and dining room where you can taste typical local dishes prepared with love and attention by the landlady, Mrs. Maria Teresa . The company , family-run , chose from the beginning to cultivate all their land in accordance with sound principles of organic farming, then absolute rejection of any element fertilizer or chemical synthesis , in order to produce healthy , genuine and respect for the environment and the consumer. Maresa is our background made from Falanghina grapes vinified in stainless steel in purity without temperature control and more refined steel for about 6 months on the lees before going into the bottle. Want to be a simple white that can accompany pasta dishes not very well developed but at the same time a wine that best expresses the unique characters of falanghina cultivated in this area. Santo Sano Roccamonfina Red i.g.t. It is our red entrance, a wine for every meal. Is fermented and aged in stainless steel to better express its simple elegance. Company's flagship product, made from the best selection of our grapes Aglianico. 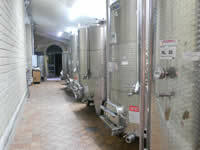 The fermentation in stainless steel and then aged for 12 months in French oak barrels. It is a wine designed to express the strength of our country, a large wine, fragrant and goes well with earthy dishes of meat, game in particular. 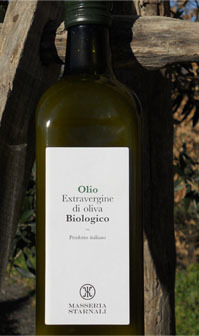 It is produced from olives of our 1,500 plants during the year do not suffer any pesticide treatment. The cultivars are typical of the area and what would later become part of the double ie the Sessana and itrana. The olives are harvested by hand when the degree of ripening is about 60%, optimal time to produce an oil of superior quality, with low acidity and many fragrances. The processing is done in cold, in a mill of our confidence that complies with the specification of the biological parameters. All of our products therefore meet a production philosophy based on manual labor, the peasant wisdom, attention to technical development and above all on respect and care for the environment.